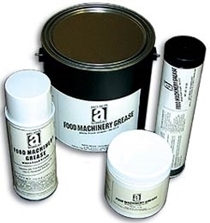 Food Machinery Grease is a white multi-purpose specialty lubricant designed for equipment used in the Food Processing Industry. It offers superior water and chemical resistance against fruit juices, carbonated beverages, salt water, beer, acetic acid, and detergents. Meets the requirements of NSF H-1 and FDA (Fed Req. 178.3570, 178.3620) for incidental food contact. Applications: All grease lubricated machinery and equipment, anti-friction bearings, slides, gears and guides found in canneries, bottling plants, dairies, meat processing facilities, breweries, etc. Recommended for applications where incidental food contact may occur.